Are you looking for a trusted name in turkey deep frying? Then this turkey deep fryer from Bayou Classic should be at the top of your list. Read our buying guide packed with information to help you decide if it’s right for you. 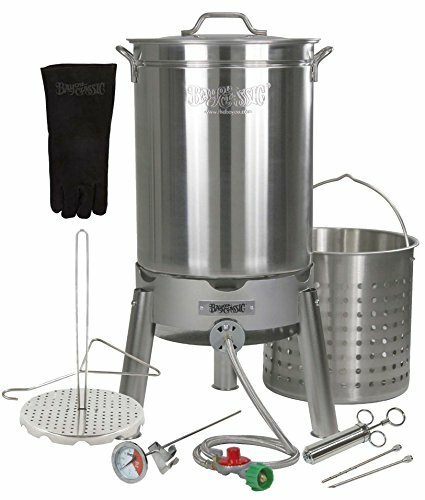 The Bayou Classic Stainless Steel Turkey Fryer is a highly-rated kitchen item on Amazon today. This is so ideal not just for Thanksgiving celebration but for all special occasions in the family too. Because this fryer is very large in size, it can cook big turkeys, chicken or any kind of meat like roasts. With these great functions and features, one needs not hire a caterer to serve sumptuous meals on the table. With this top-of-the-line turkey fryer, it doesn’t take another Thanksgiving or Christmas day to serve turkey on the table. This top-quality turkey frying pot does not include a cooking kit. You’ll also need an outdoor deep frying stand that runs on propane (you supply the bottle!). We recommend the Bayou Classic High Pressure Outdoor Gas Cooker. It has some excellent reviews on Amazon and comes with high praise! Since this is a 30-quart turkey fryer, he can fry turkey, even the large-sized and heavyweight one. Vegetables for side dish and seafood for other palatable treats can also be cooked in this highly-rated fryer. This cookware piece comes with a sturdily made perforated basket that can be used for steaming. Do you have a Foodie in Your Life? This would make the ultimate foodie gift for that BBQ enthusiast that you know. Just hope that they invite you over for their first deep fried turkey! Can also be used to boil veggies, seafood, etc. How would you feel if you see your loved ones feasting on a slice of crispy and juicy turkey? Doesn’t it feel so fulfilling? Well, from now on, you won’t just imagine and think of this feeling. You can actually make this happen! With a Bayou Classic Stainless Steel Turkey Fryer, you can always serve the people so dear to you the festive dish be it on a special occasion or just the ordinary day. Patience is never tested too, while deep-frying a large turkey. You can perfectly and deliciously fry this traditional Thanksgiving food in just short 45 minutes. And for your everyday meals, you can deep-fry up to three whole chickens in just 20 minutes. Make any day a Thanksgiving Day with this kitchen bestseller. Click the button below and be led to Amazon page to buy the Bayou Classic Stainless Steel Turkey Fryer. Looking for an Indoor Turkey Fryer? If you live in a very cold climate, or are just concerned about the safety of having a big pot of boiling oil on a stand, you may want to consider an indoor deep fryer. What are your thoughts about this turkey deep fryer? Leave a comment below and let us know. Also be sure to give this article a share on Facebook, Twitter, or, Pinterest.